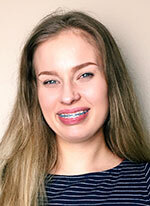 One moment, one choice shows why 18-year-old Grace Albertson will receive the archdiocese’s Spirit of Service Youth Award on April 26. The moment unfolded at the beginning of the school year in 2012 when Grace was a seventh-grade student at St. Mark the Evangelist School in Indianapolis—a year when the first wave of Burmese refugee children arrived at the south side school. “I was out at recess on the blacktop, and I looked onto the grassy area where three Burmese students were playing soccer together,” Grace recalls with a glowing smile. “They weren’t playing with the other kids. Something struck me about that, and I had a strong desire to talk with them. But they were speaking in Burmese, and I didn’t know Burmese. At recess the next day, she saw the same three students playing soccer, so she nervously approached them, holding her pad with the Burmese phrases. It was also the start of Grace’s six‑years-and-counting commitment to help refugees to the United States make an adjustment to life in Indianapolis. During that time, she has taught English to Burmese and Syrian children. She has greeted refugee families at Indianapolis International Airport, and helped them make the transition to life in their apartments. And she has spent parts of two summers in South Korea, teaching English to children there. Grace has definitely served as an example for the people of St. Mark Parish, says its pastor, Father Todd Riebe. She wants to continue that effort through her service and her studies when she attends Marian University in Indianapolis.